I'm thinking about swapping my current commuter run around (Smart) for something a little more practical (particularly for the winter). There are a few Savvy's about for sale near me, plus one Satria Neo. I might go have a look and test drive soon but wanted to ask owner's experiences. My commute is just under 20 miles each way, mix of rural + dual carriageway. I've done it in other cars including 80bhp hatches and my 137bhp Rover, the latter is more fun but expensive! As long as performance is good enough to thrash it out onto a dual carriageway without too much fear of getting rear-ended that's fine. I like a car with reasonable handling but obviously I wouldn't expect too much out of a Proton. Main thing is it has to be practical for the drive I'm doing particularly in the winter: demist quickly is nice, but mainly I would like to know if its possible to drive either of these cars in light snow / ice as long as you drive sensibly. Would like an honest opinion, if you think WTF are you doing that sort of commute in a Smart and doubt that a supermini would be much better that's fair enough, it would be good to hear either way. But these cars seem like a good cheap way to get from A to B and it's something a bit different so does appeal to me. Hi, Welcome and well done for thinking beyond the obvious. It's telling from your post that you're not at all familiar with Proton, but no-one on here will hold that against you, as few non-owners are. First off, a good handling/ride balance is one thing you really should expect from a newer Proton - it's one area the cars often put the 'big maker' rivals to shame. Even a couple of the older Mitsubishi-based models, (the Coupe and Satria GTi) have good reps in the handling stakes. One of the reasons is all these models were chassis engineered with serious input from Lotus, which Proton, (or rather their parent company) have also owned since the 1990's. Any of them will humble a Smart for cornering. A trawl through the Savvy/Neo posts on here should answer most questions, IMO the Savvy drives well, but is the weakest link in the later-era Proton range with too many potential reliability issues. Owners on here may dispute this, but I think the Neo is a more substantial/sophisticated and serious effort, but in using a larger platform/engine it will not be as cheap to run as a Savvy, all things being equal. Do not discount the three other 'modern' UK imported Protons, (the Impian, GEN-2 and new Persona) as they also drive nicely, assuming having been properly maintained. Hi and thanks for the advice, it's encouraging to hear they handle well and the Satria Neo certainly seems an attractive option on that basis. Doing a bit more reading around the suspension setup I see it has independent multi-link rear suspension, and if its had Lotus involvement then it makes sense that it would handle well. 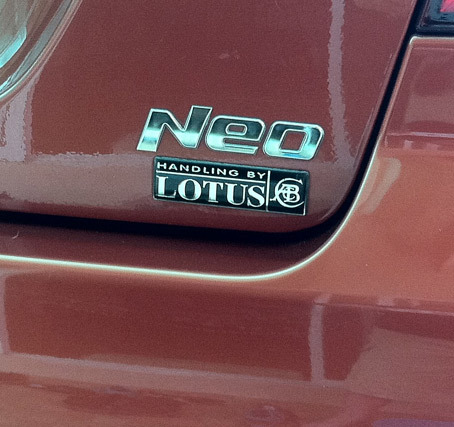 I also notice they had the confidence to badge up the Neo with the Lotus logo too. Initially I didn't even consider the Savvy, but the looks have grown on me and I have to be fairly practical about whatever I choose - smaller and more economical is probably better (my wife is using one car for her work and I have my Rover as well so space is limited), plus there seems to be more Savvys about to choose from. I think I will test drive a Savvy to see what they're like since there are some closer to me for sale than Satria Neos, but probably won't rush into getting anything. Just want to know if I can see myself in one of these. Reliability issues on the Savvy is a little disheartening but I'm fairly mechanically minded and can do most straightforward jobs, change a sensor, thermostat, sort the brakes, general servicing that sort of thing. But I'd rather not spend all my spare time on whatever I get, I get a little annoyed with the Smart because parts wear out quicker than anything else I'm used to and they can develop some quirky faults but once you get used to the design of them they're not so bad to work on (the German engineering is only really evident on them when rusty looking bolts come out first try with threads clean as a whistle). I will report back if I take a test drive. Until then any more advice appreciated. Particularly interested in what these cars are like to run through the winter. German engineering wasn't that evident in my 9 yr old Golf. Had to fight to get any bolts out underneath, as they rusted so badly and stripped. My 14 yr old Proton is in much better condition. The Jumbuck (pickup) is great in winter as the cab heats up really quickly, being only for 2 people. Protons come from a hot and humid country, rather than somewhere with frozen landscapes, but my Persona copes well enough, although the heated rear window isn't the fastest it's better than a typical Ford and the very good aircon helps dry the incoming air quickly to stop it misting up. Having a car with it's door rubbers in good condition, (no matter what the make) will help a lot, which is why a typical older car will mist-up more than a brand new one. I run my car on a set of steel wheels fitted with winter tyres from late November until Spring, which of course gives it an unfair advantage, (mine being an automatic also helps) but the first winter I had it on the factory tyres and it coped as well as any other similar size/weight FWD car in the snow. As to Savvy reliability, if you find a looked-after car in good condition, (checking that everything is working) then there's a good chance it's going to stay that way. In case you hadn't yet found-out, the Savvy utilizes a lot of last-model Renault Twingo components. It's inevitable that like many other cheaper cars, Protons can often attract the worst sort of owner who wants the most/newest amount of metal for their cash, (or credit) and are not inclined to spend much money or effort on running it properly. Get a cared-for car though and you should be laughing all the way to the savings bank. Good luck with the search. welcome along, pretty much any one will feel an upgrade from the smart. and in the colder months should be more than adequate. Think my first reply to OP covered that - I too was motivated to reply myself because of that 'outrageous slur' of lumping Proton with the likes other 'budget' car brands from the Pacific-Rim, many of which like the Missus' same-era GM Aveo, handle like a 3-legged hippo compared to my Proton. Obviously, the Persona is a class or two above a T250 Aveo in size, but comparing with Father's more similar 2018 SEAT Leon reveals the Persona to still being competitive in terms of overall ride comfort, damping control and weight transfer - and it's steering feel is superior. Only in terms of ride quietness does the new Leon have a definable edge in this area, although other aspects of the car are way better as you'd expect some 10 years on. Another thing readily forgotten is that MGRover a few months before it sadly died in 2005 were keen to use the GEN2, (and the still then unlaunched Persona) as a replacement for the 25 and 45 ranges, Autocar even mocked-up an image of a GEN-2 with a 'Rover' grille when it covered the story. For whatever reason Proton walked away from the deal, maybe they came to realize just how much trouble MGRover was in by that time and were worried about getting paid. As it is, the deal they did in P.R. China to supply Europestar was likely more attractive anyway. Last edited by SlushMatic on Mon Nov 12, 2018 12:57, edited 1 time in total. Neo coped with winters well, no better than other Marques but also no worse . As I often deal with parts enquiries from club members I am pretty well placed to give you some info on common complaints of those models. Spares availability is mostly fine in Malaysia for both models, but virtually non-existent in the UK. Even the dealerships barely stock anything and the only order stuff in upon demand, so the main thing is always anticipate possible MoT fails and get the parts in stock as soon as early as possible. If you fail an MoT you could be off the road for a couple of weeks while parts arrive as you won't be getting very many bits from Eurocarparts or motor factors beyond filters and spark plugs. Rear calipers leak when seals get old. Handbrake cables jam up due to rust/wear inside the sheath. Front brake discs are unique to the model and VERY expensive. Only available through dealer. Skim old discs to re-use or modify to use Gen2 discs. Exterior door handles break and come off. Cheap and easy to replace. Exhaust system UNAVAILABLE. Patch up original sections by welding or get custom stainless made. Speed sensor on gearbox goes faulty causing erratic speedo reading and limp-home-mode. Easy and cheap to replace. Power steering pressure sensing switch leaks when internal seal fails. Easy and cheap to replace. Clutch cable wears and snaps. Only available in Malaysia. Not too expensive to replace. The standard rims use an odd tyre size that many places do not stock, and only a limited number of manufacturers even make them, meaning they are more expensive than you would expect. They use a Renault Clio engine that will be more familiar to mechanics than the CamPro engine used in the Neo. Only rated as a 4 seater, so no seatbelt at all in the rear centre. Could be prosecuted for carrying 3 people in the back. Excellent info there for many Club Members. I didn't have any issues sourcing this size from various outlets with a choice of tyre brands, but maybe it's a regional thing. Should be fine anyway to fit 185/60 as an alternative if needs be. 175/50R15 for the Savvy Style or 165/60R14 for the Savvy Street. I've never tried to buy one, just heard owners whinging about how expensive they are and that the available brands are limited. I'm not sure which of they two they struggle with. Wow thanks so much useful info, I have had less luck with other car forums in the past. None of the problems listed so far sound particularly scary so that's encouraging. I may have to wait until next year now before I embark on replacing the Smart to wait and see what's happening with the missus work situation. In a way that's good, stops me from rushing into buying something so I can hopefully get a good example of whatever it is I buy. Certainly leaning towards the Satria Neo since I think it would be a fun car to own.